I wanted to create a workflow that executes several custom activities in parallel and adds the results from each to a shared collection. 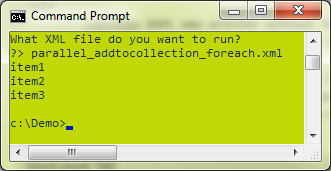 This is easily accomplished by using WF4’s AddToCollection activity. The XAML below demonstrates the use of both the Parallel and AddToCollection activities to accomplish this task. I’m also using of the ForEach activity to iterate through my collection to display the results.